Robert Herbert was born at Rosneath manse on January 28, son of the Rev Robert Story and his wife Helen Boyle Dunlop. After home teaching from his father and learning mathematics and other subjects at the parish school, he studied arts at Edinburgh University from 1849-54, gaining distinction in literature and philosophy. He spent a semester in 1853 at Heidelberg. He won prizes for poetry, and Professor Aytoun urged him to discipline his gift for verse. He wrote later much occasional poetry, including some excellent hymns. 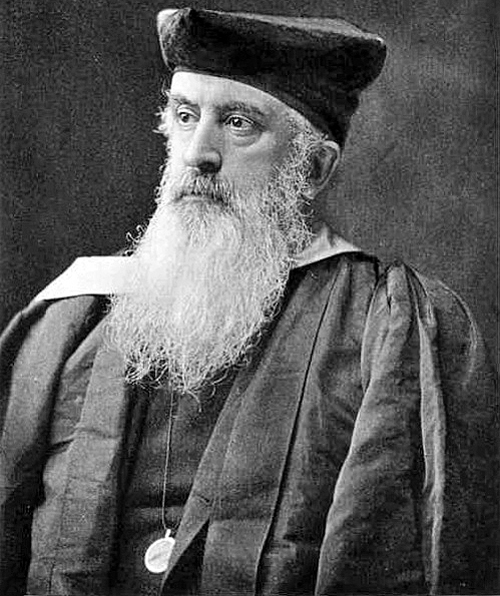 He studied divinity at Edinburgh and St Andrews Universities from 1854–7, and after the first of many continental trips was licensed a preacher by the presbytery of Dumbarton on November 2 1858. He served as assistant in St Andrew’s Church in Montreal, Canada, from March to November 1859, when he left to become assistant to his father at Rosneath. Before he arrived home his father died and the patron, the Duke of Argyll, presented him to the parish into which he was inducted on February 23 1860. He sought to systematise the form of service and to modify the old observances at the celebration of the communion. With two others he founded, on January 31 1865, the Church Service Society, which in the course of years efficiently transformed ancient usages. He persevered in spite of opposition, and he had the satisfaction of seeing his views prevail. He proved himself an ideal country parson, gradually became a leader in the church courts. From 1863 to 1876 he attended the General Assembly of the church in accord-ance with ordinary regulations, but through special provisions he was a regular member from 1877 onwards. He became one of the ablest debaters in the house, advocating useful measures and sensible reforms. His name is particularly associated with discussions on Sabbath observance, the abolition of patronage, the Free Education Act, the adaptability of the Confession of Faith to modern conditions, and, notably, the movement for disestablishment before and after 1885. In May 1886 he was appointed junior clerk to the General Assembly and in 1894 he was moderator, closing the meetings with a lucid and stirring address on ‘The Church of Scotland, its Present and its Future’. Next year he became senior clerk of the Assembly, holding the position for the rest of his life. From 1885 to 1889 he edited a magazine — first called ‘The Scottish Church’ and then ‘The Scots Magazine’ — primarily designed to support the principles he upheld. He had grave doubts about the wisdom of the Free Education Act, but he resolved to make the best of it when it had passed, and he was chairman of Rosneath school board from its first meeting in March 1873 until he left the parish. In 1886 he succeeded Dr John Caird as chaplain-in-ordinary to Queen Victoria, and the appointment was renewed in 1901 by King Edward VII. The second phase of his career began on November 9 1886 when he became professor of church history at Glasgow University. While zealously performing his special work he readily responded to the numerous calls which the city made upon him. The annual Baird lecture in Glasgow was endowed by James Baird who in 1873 established ‘The Baird Trust’ and gave it £500,000 to be used for aggressive Christian work. He also actively interested himself in the position of the church in the Highlands and in India, and in the Layman’s League and home missions. In 1898 he was appointed principal of Glasgow University in succession to Dr Caird, which prevented him from writing so much as formerly. He edited and contributed to the monumental ‘History of the Church of Scotland’ in five volumes, which appeared over several years. The fruits of his work were in many striking additions to the efficiency of the university. It was largely through his influence that the fund for the better equipment and extension of the university was established. In a few years it brought £76,000 to the hands of the College authorities, and enabled them to keep the ancient university in the front rank of teaching institutions, by building and equipping laboratories for the study of modern science. Among the great public events in which he took the leading part was the ninth jubilee of the university in 1900, when it fell to him to receive the congratulations and homage of representatives from most of the universities and learned societies of the world. At the same time he was a convinced champion of ‘the humanities’, and his tenure of office was not free from friction with students. He did not fully approve of the Carnegie Trust for the benefit of the Scottish Universities, partly because of the exclusion of literary studies from its scope, but chiefly because of its haphazard scheme for the payment of fees. But he fully recognised its value as a means of encouraging post-graduate research. Not a Gaelic speaker, but familiar with the language spoken by 10% of Rosneath residents in his youth, he was principal at the time that Gaelic became established as a subject of study at the university. He was made hon. D.D. of Edinburgh in 1874; hon. LL.D. of Michigan University, U.S.A., in 1887; hon. LL.D. of St. Andrews in 1900. He was also a fellow of the Scottish Society of Antiquaries, and he reached high office as a freemason. He was characterized by an absolutely fearless honesty, which sometimes gave offence, but at the basis of his nature there was a warm, tender and sympathetic heart, incapable of meanness or intrigue. On October 31 1863 he married Janet Leith, daughter of Captain Philip Maughan. Mrs Story was the author of three well-constructed novels, ‘Charley Nugent’, ‘The Co-heiress’ and ‘The St. Aubyns of St Aubyn’, and of ‘Kitty Fisher’, a children’s story. In 1911 she published some interesting ‘Early Reminiscences’. After a period of gradually declining strength he died on January 13 1907 at his residence in Glasgow College, and he was interred at Rosneath. A memorial window was unveiled in Rosneath Church on September 24 1908, and another was placed in the Bute Hall at Glasgow University a year later. Two surviving daughters, Elma and Helen Constance Herbert Story, jointly wrote a book about their father.